when i really find something unique n worth sharing. changed its name to Dal ki roti ) an easier one . Mix both the flours and salt in a big bowl . two plastic sheets or silpat n carefully roll into thick rotis). hot with chutney , vinegar onions & vegetable curry . :) Nice variety of roti.. my daughter is really really picky abt her proteins.. n i'll try this 1. Does it remain soft through the day or I need to serve it hot?? Wow! Must try this out! Dfntly a protein powerhouse , worth trying . I love spicy food can i mix green chillies n finely grated onions to it ? 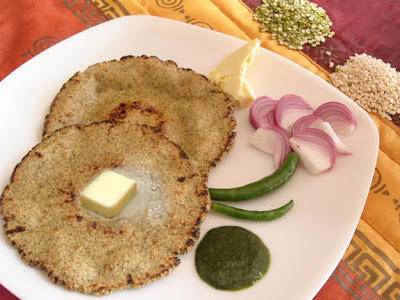 Thats a very yummy protein packed rotti...looks yummy..I generally mix left over dal in atta and make paratha's.. This is an interesting recipe. Would love to try this. Thanks for sharing. This is very new to me and I must try this out. thanks for the sharing Smita. Although this recipe involves lil hardwork but believe me its worth it , tastes v diff than the rotis of flour kneaded with cooked / leftovr dal . @Mindful Meanderer - This tastes best wen served hot ( right from the griddle ) . @ Saumya - Adding chopped chillies / onions will make it difficult to roll . Absence of gluten in this flour makes a bit difficult to roll in comparison to normal wheat flour - rathr u can add heeng (asafoetida) n chili pdr for a spicy version. i don't like dal either! i've not tried dal ki roti but i did try out a dal tikki recipe that was recently featured on femina. turned out to be truly delicious! i'll tell my mother to make me this roti next. Looks a very unique preparation. Looks very healthy and tasty as well. Also very well decorated. esp love his music . Everyday i do it for u ..
i really enjoy your blog and all the beautiful dishes that you churn out. i've decided to present you with "one lovely blog" award. visit http://rimakaur.blogspot.com/2010/03/two-awards.html to get it! keep it up! Smita nice recipe will definitely try and let u know dear. I make with left over dhal but I am sure this tastes very different from that.. looks so good and healthy. i just remembered that my mother DOES make this roti! but she makes it using left over dal. they turn out to be so yummy and crispy! Thanks for such lovely comments friends , do try out n let me know. @Satish Saxena - happy to know that it was ur fav . Its surely a pleasure to revive such a old n almost lost Indian speciality !!! @ Rima - thanks for passing ovr the award ,I'l surely link it in the nxt post !! I love roti...I have not had it in months and I miss it so much. Excellent recipe with lots of protein. first time here and you have great presentations here. I'm following you. New to me , sound really healthy . My family loves Indian food , n we oftn eat out Indian food here - this lovely recipe reminds me of the yummy naaans n rotys !!! The pictures you are making to illustrate the recipes are gorgeous. Sometimes I drop in at your blog just to look at the photos once again. Something within me reacts so well for what I see (may be because I am a fond of photography as well :) ). And I am also thinking to organize some dinner in an India style and invite our friends to it. The recipes will be taken from this blog! Hi Smitha! Please accept the award from my blog. First time I heard about a lentil tortillas, sounds great! I'll have to make this soon, it's going straight into my food-to-try queue. Hi smitha, your ideas are great.My son loves very much.God give nice talent to you.we all are luckey to learn your ideas.pelase tell me your mother toungue.I do no english properway.